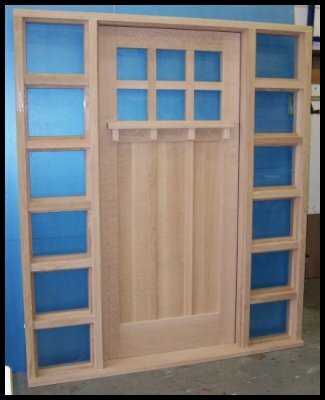 We ship these doors and entry systems all over the country in specially constructed heavy duty crates. Shipping is done at actual cost, crating and packaging is complimentary and our shipping record is unblemished. There really is no need to settle for less than a perfect fit for your home. Please call us for a free quote. A great example of how we can help improve your home. 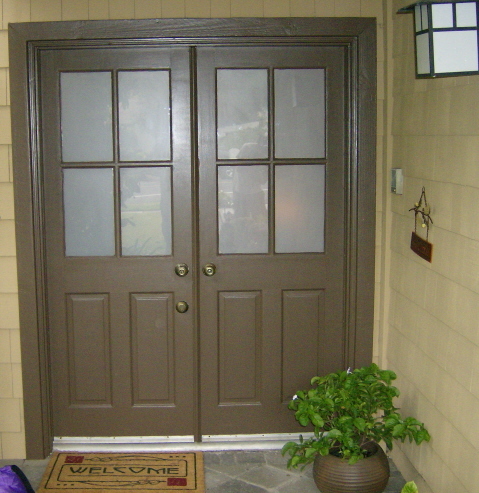 Before : Old and tired double doors......fresh paint hides a very real security issue! 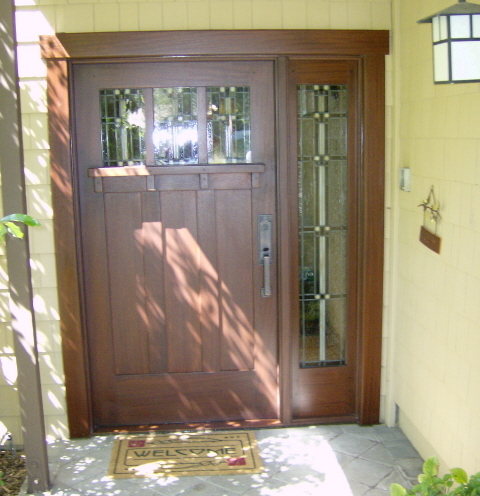 After : New Classic Craftsman 3 lite over 3 panel door & matching sidelite in solid Mahogany. 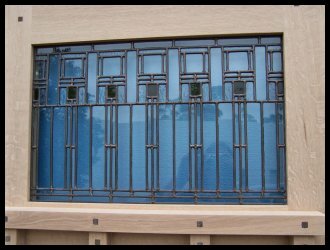 Double glazed with custom leaded glass on the interior and clear tempered glass on the exterior. 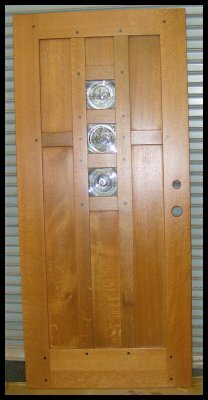 Features a heavy duty jamb assembly, Mortised lock set, Q-lon weather strip and a Pemko automatic door bottom. Authentic detailing, energy efficient and totally secure. make. 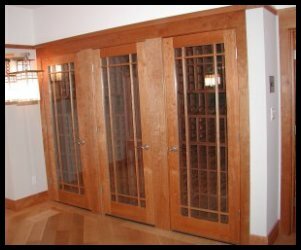 The superior fit and finish of these furniture quality doors really makes the difference between building an ordinary house and creating the ultimate Arts & Crafts home. 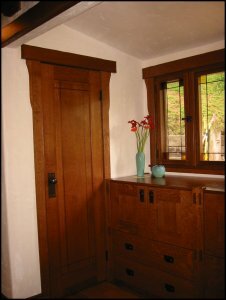 These beautiful handcrafted doors are available in a variety of Craftsman & Mission styles as well as our very special California Bungalow and Greene & Greene influenced designs. 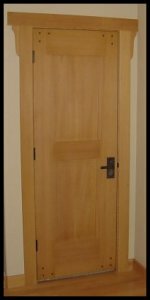 Since all of our doors are hand crafted there is no upcharge for unusual or non-standard door sizes. 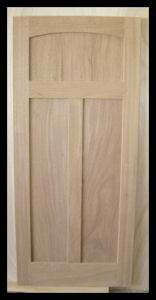 This means you can order a door from us that will fit directly into your existing jamb or rough opening. 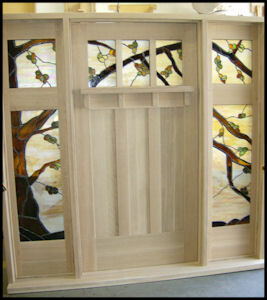 All of the doors we make are available finished or unfinished. 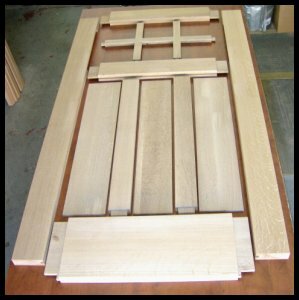 We make door slabs ready to be fit into existing lambs, or pre-hung with matching jambs. 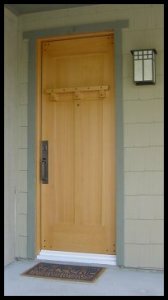 We also make entry systems complete with heavy duty jamb / theshold assembly, pre-hung door, weather-strip, and your choice of lock hardware and a variety of glazing options. 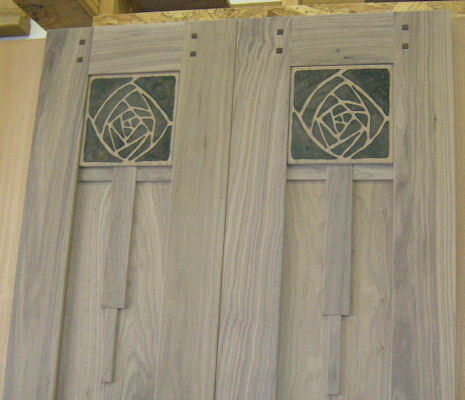 Custom trim can be ordered for any of these doors. 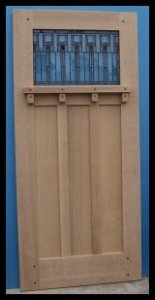 to make the comparisons between our authentically made Arts & Crafts style doors and those of our competition. 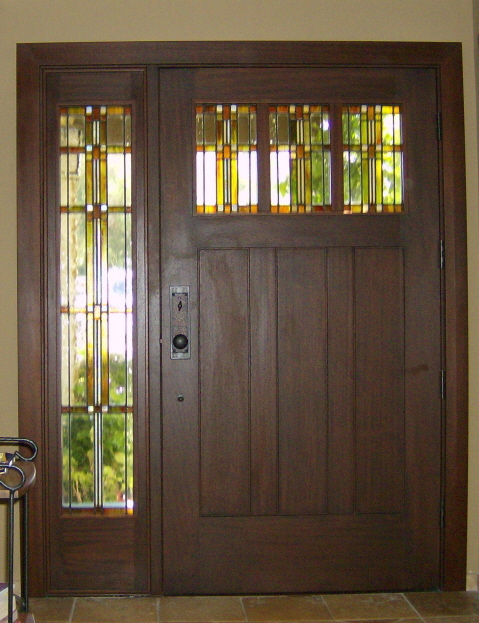 We are confident you will agree that the real beauty of our doors is more than just skin deep. They are without question the real thing and are sure to be a focal point of your Ultimate Bungalow. 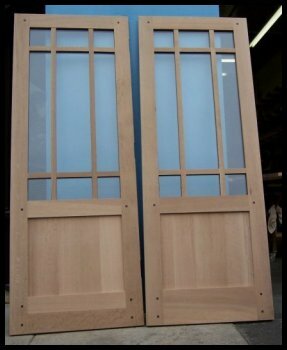 Please see our door construction page to learn more about this subject. Note that haunched mortise & tenon joints are used for all stile to rail joints. 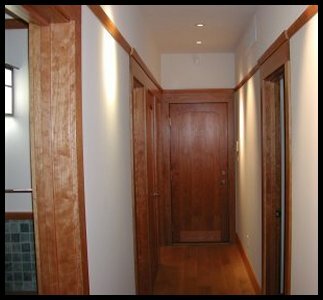 entry systems feature matching stain grade jambs and thresholds. 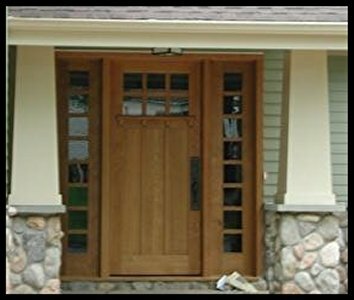 Entry systems which incorporate sidelites and /or transoms have jambs are typically constructed from 8/4 stain grade material to provide structural integrity and an authentic Craftsman appearance. 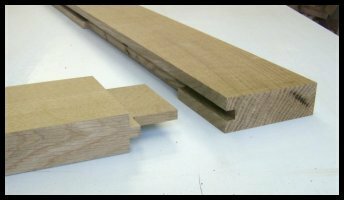 Since we mill all of our own stock, special threshold or jamb configurations are available. Ask about our Custom trim packages. Matching brick or stucco mold is available. We regularly incorporate a variety of authentic Craftsman type details such as contrasting species plugs or square pegs. 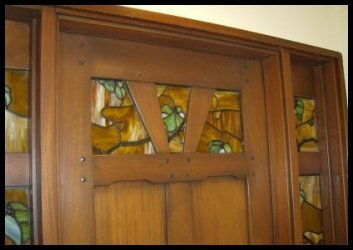 How about a "Dentil" type accent shelf or some Arts & Crafts inspired leaded glass? Other options include hand carved or laser etched panels. 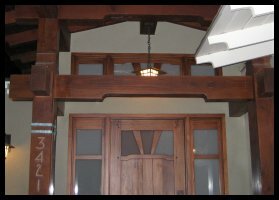 Need a "speakeasy" or a custom fabricated transom? Not a problem. How about custom trim kits? We have done hundreds of these in a variety of designs including personalized "theme" accents. 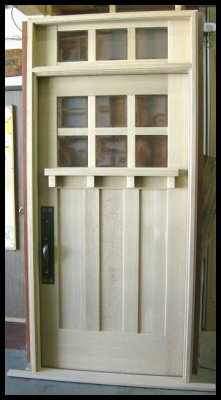 Want opening sidelites or need a very wide jamb? No problem. We are happy to make whatever you need. 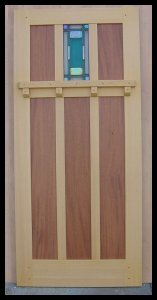 Please see our Exterior Doors or Interior Doors pages for more information on some of the door designs we offer. All the doors we make carry a Warranty. 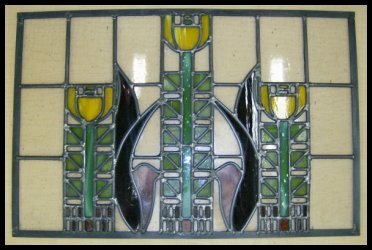 Our product focus is on the designs of the Arts & Crafts Movement. will be glad to furnish a quote. 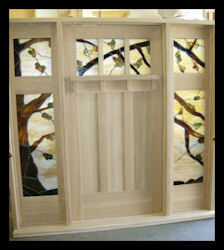 In addition to the doors themselves we can provide matching pre hung jambs, sills, sidelights, transoms and trim kits. We offer Q-lon weather strip as a standard product on all our exterior doors. 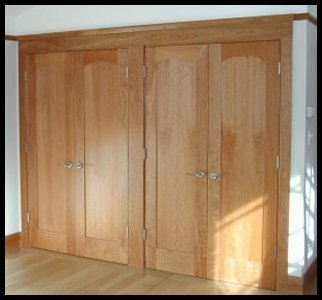 All of our doors are available finished or unfinished. We are proud to offer the latest in high durability and environmentally sound products by General Finishes. We have adopted as our standard finish their latest Low VOC Polyurethane Varnish which we have found offers the ultimate in protection against the elements. All of our topcoats are applied by an HVLP spray system for even coverage. Available in any size or configuration you require. Features the G & G classic "Cloud lift" and contrasting square pegged detailing. and Craftsmen Hardware. Please call us for more information on these products or visit our door hardware page. Hardware installation can be done in our shop prior to shipment for any of these systems. If you wish to supply your own hardware that is fine with us, and we will be happy to install it. 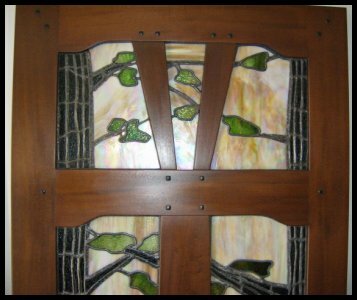 Leaded and stained glass designs are available and are handcrafted in our own studio. We also offer a full range of conventional glazing options including dual pane, tempered and laminated glasses and obscure or etched glasses. We ship local and cross-country regularly and offer this service to our customers at our cost. 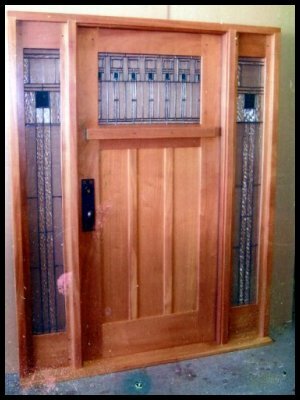 These doors are a very popular item with homeowners interested in doing a makeover on their modern home or restoring their historic Bungalow to it's former glory. Call or contact me with your requirements for a free quote. 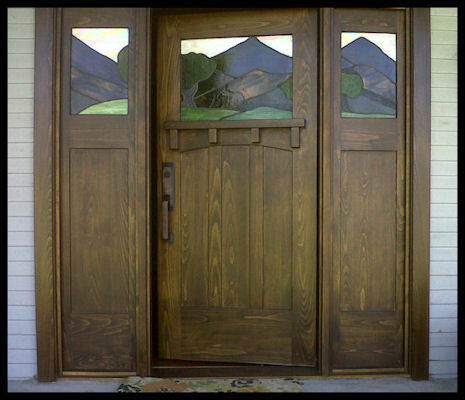 Classic Craftsman style entry doors available in any size and configuration. I can't believe I haven't sent you a message since we got the doors. Yesterday we had a plumber come over to check on a leak in the slab. When Mike opened the door the guy said that he had been going into homes for 22 years and that ours was the nicest door that he had ever seen! I can't really think of the right word to describe them - but, the way I think of it is that I don't ever want to live in a house that doesn't have a door made by you. 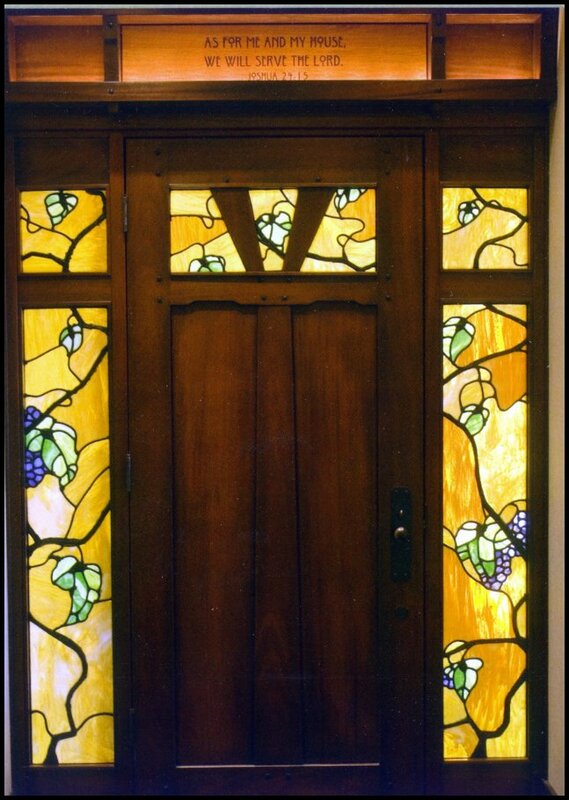 When I open the door or the sidelights it is like opening the door of a church or a bank. I know you weren't crazy about putting screens on the sidelights - but, you have no idea how much we love them. With two sidelights that big, the fresh air and breeze that comes in makes the entire house cooler and since we don't use the air conditioning the difference is like day and night. Also, with the size of the sidelights it gives it almost a patio - like feeling when they are open. I want Mike to put some kind of water feature outside and we will be able to hear it all over the house. I just wanted to say thanks and let you know how much we love them. I just could not wait to send you some photos! 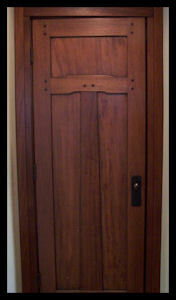 The door has bot yet been stained and the trim is not up but here is a first look. My husband, my two boys and I are just like kids at Christmas - we keep wandering into the entry way to see the door. What a wonderful transformation it has brought to our home. Thank you for your beautiful work!! 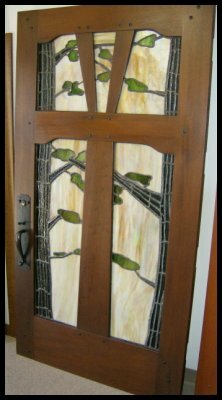 Many styles, species and options available See our Interior Door page for more info. 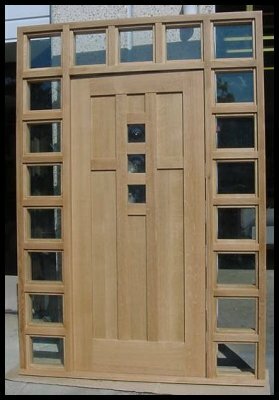 Available in any size or configuration, with or without glazing. Sized to fit any rough opening. Finishing and Hardware installation available. Ships in heavy duty crate via common carrier. 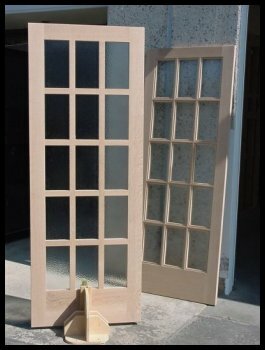 Exterior and Interior French doors available in any size, configuration or wood species. 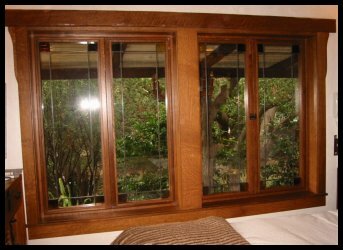 A great way to bring some natural light into your Bungalow or Mission style home! 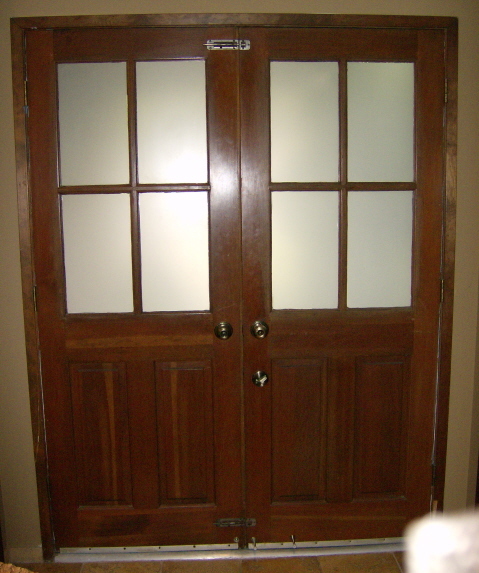 Left : Mission style Cherry 9 lite French doors with Argon filled dual pane glass and matching trim kit. 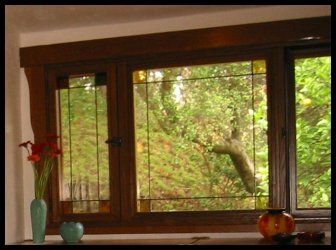 Handcrafted Mission style leaded glass windows in quarter sawn white oak casements & custom trim. 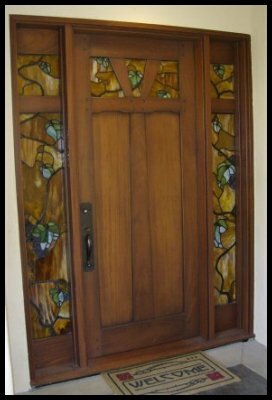 Made to customer specifications with a combination of restoration and antique stained glass. 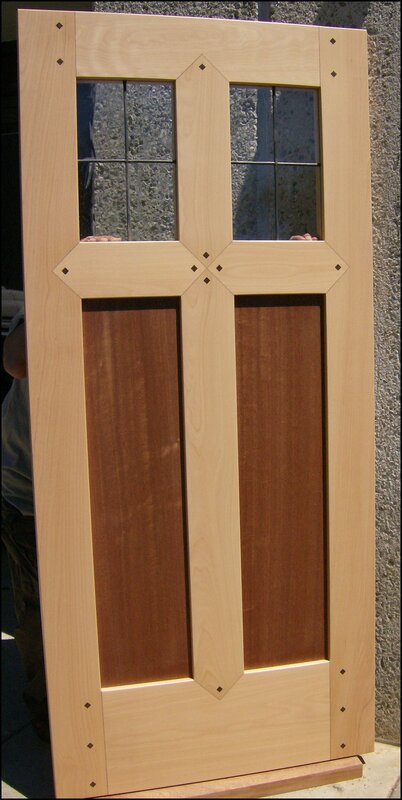 Left : Mission style Cherry bi-fold closet doors with matching trim kit. 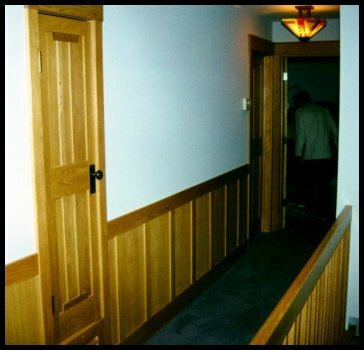 Right : White oak Bungalow style furnace door with vent and matching wainscoting. 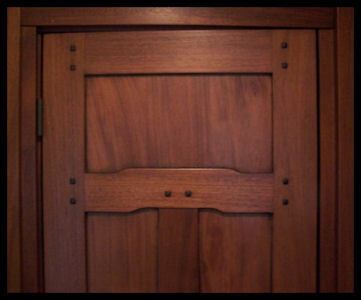 Right : Mahogany Designer #1A interior door on utility closet. 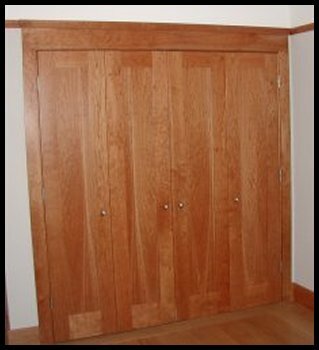 a "His & Hers" Mission style walk-in closet doors or a classic Mission style interior door .......we can build it. Please call us if you are looking for something unique. Upper left : FLW inspired Collanade Upper right : G & G inspired free form "Grape leaf & Grapes"
Below Left : G & G inspired free form"Cloud lift" Below right : G & G inspired free form "Coastal Redwoods"